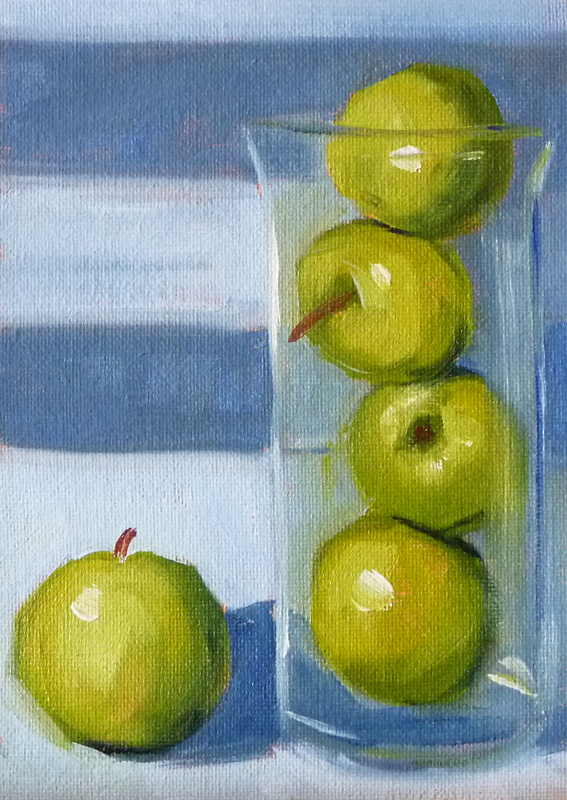 Apples and glass have been common in my most recent paintings. Living in Washington State, apples are always on the table, so they make a very handy subject. Since we have had a record breaking amount of rain this month I haven't been able to get out of the house. 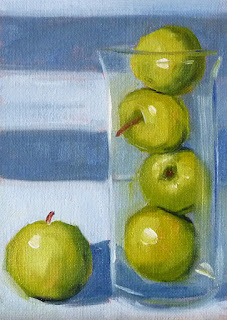 It has been easy to keep painting these little still life subjects with apples as the stars. 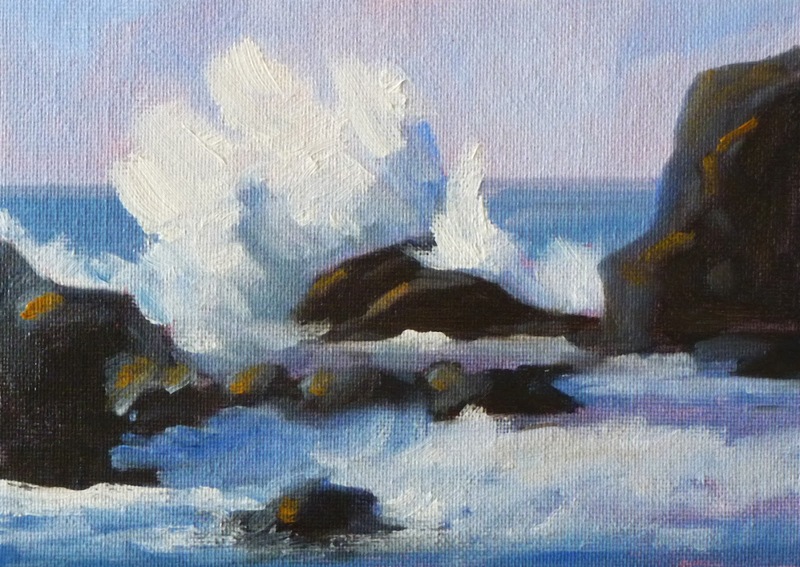 This painting is a 5x7 inch oil painting on a canvas panel. You can visit Etsy shop to view it or make a purchase. This is the first in a series of little cat faces that I painted recently. 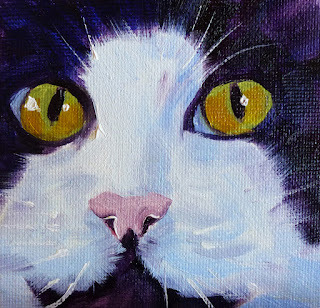 The eyes are what attracted me to painting these little 4x4 inch portraits. My son likes my animal paintings, and made a special point of telling me I needed to list this series. He has a collection of animal portraits that includes a goat, a gorilla, and I don't remember what else. There is also a little baby chick painting that has his name on it. It will probably appear in his hands on a special occasion sometime in the future. This painting is for sale at my Etsy shop along with one of his mates. Click here if you would like to see him in the shop or make a purchase. Or, click here to see his mate. My garden is full of enormous peony blooms. Red, white, pink, all have a presence. Unfortunately, the rain keeps knocking them over. I've placed wire cages around them hoping they will stay upright, but the blooms are so heavy that even a little bit of rain and they are flat on the ground. The salvaging process requires that I cut them, put them in vases, and bring them inside. Then I force them to sit for me while I paint their portraits. This little portrait is 5x7 inches and is offered for sale at my Etsy Shop. Click here to view it or make a purchase. Follow this link to see some of my other small floral paintings. Today's painting is listed for sale at my Etsy Shop .. It was inspired by the abundance of produce emerging from my garden. The funny part is that I didn't expect anything to grow. A friend of mine gave me a box of expired seeds including radishes, three types of lettuce, and two kinds of spinach. I threw the seeds in months ago thinking that if they came up, great. If they didn't, I wouldn't be disappointed. I've planted expired seeds with poor results in the past, but this year everything came up. I've been harvesting for weeks. 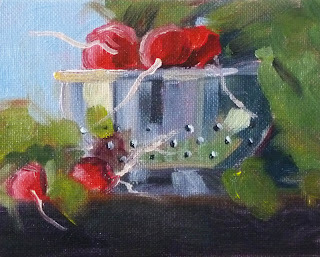 It is delightful, especially that those radishes are such willing subjects for my paintings. This painting is 4x5 inches on a canvas panel. 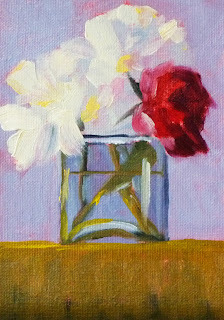 Check here to view all of my still life paintings that are for sale. Or, check here to view this painting in the shop or make a purchase. Today's painting is another that was inspired by the Deschutes River Trail near Bend, Oregon. 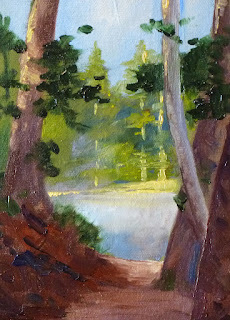 It is a lovely trail that weaves along the river, through pines, and towering trees. Every time I hike this trail, I come home with plenty of inspiration. The painting is 5x7 inches in oil paint on a Raymar Canvas Panel. Visit this link to view it in my Etsy Shop or make a purchase. Almost every time I visit Central Oregon, I hike the Dechutes River Trail. This 5x7 inch oil painting was inspired by a visit this past April. The weather was still trying to decide whether to move into spring or stick with the winter. The sky vacillated between snow and sunshine. 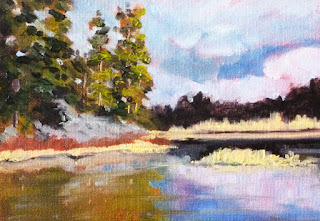 The painting recently SOLD at my Etsy Shop, but you can view some of my other small landscape paintings, paintings of trees, fields, or barns and buildings that are for sale in the shop by clicking on the highlighted links.